Interested in learning more about the tax incentives available for conservation easement donors? The policies change year-to-year, but there are several reliable sources for updated information regarding federal, state, and estate tax incentives. To learn about the federal tax incentives, including the enhanced easement tax incentive, visit the Land Trust Alliance FAQ page. For more information on Virginia’s Land Preservation Tax Credit, visit the Virginia Department of Conservation and Recreation site. Click here for estate tax information from the Land Trust Alliance. --Dan Hodges of Franklin County. 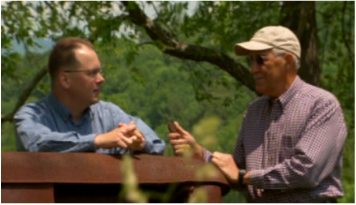 The late Mr. Hodges worked with the Blue Ridge Land Conservancy to protect his family farm in Hardy. --Arnold Hurt. Mr. Hurt and son David (left) worked with the Blue Ridge Land Conservancy to protect their family farm in Franklin County.